GHS 1st. 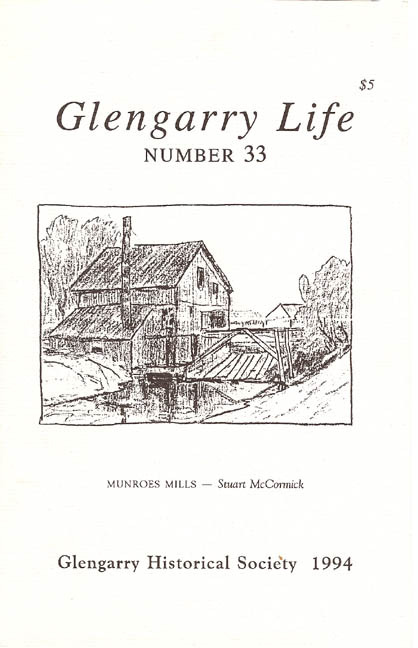 Annual 1961-62, [1st a] grey cover, photo of Glengarry Museum, 14 pages + cover mimeographed. GHS 2nd Annual 1962-63 [2nd a] orange cover with photo of Opening day Glengarry Museum, some illustrations, 24 pages + Covers, mimeographed, has Museum at Dunvegan location map on back cover. GGRL as photocopy. GHS 3rd Annual 1963-64,[3rd a], green cover, photo of Congregational Church, St. Elmo, some illustrations, 24 page + covers, mimeographed, has Museum at Dunvegan location map on back cover. GGRL as photocopy. GHS 4th Annual 1964-65 [4th a] orange cover with photo of Cairn at Lancaster, some illustrations, 39 pages + cover, mimeographed. GHS 5th Annual 1965-66 [5th a] red cover with photo of Ruins of the old Lime Kilm, highway 43, 3rd Kenyon, some illustrations, about 75 pages + cover. mimiograped. GHS 6th Annual 1966-67 [6th a] blue cover with sketch of Nor'Westers Museum Williamstown, mimio graphed, some illustrations, 46 pages+ cover, GGRL as photocopy. GHS 7th Annual 1967-68, [7th a] green cover, with photo of old barn, some illustration included, 38 pages + cover. mimeographed. GHS 8th Annual Anniversary Volume 1959 - 1969, [8th a] light yellow cover with sketch of trees & stream, 36 pages + cover. printed no indication where. GHS 10th Annual 1970-71, [10th a] red cover with sketch of the ship Nonsuch, 42 pages + cover, mimeographed. GHS 11th Annual 1971-72, [11th a] white cover with sketch of St. Columba Presbyterian Church Kirk Hill, 52 pages + cover. mimeographed. GHS 12th Annual 1972 [12th a] light yellow cover with sketch of a pioneer kitchen, 29 pages + cover. printed no indication where. 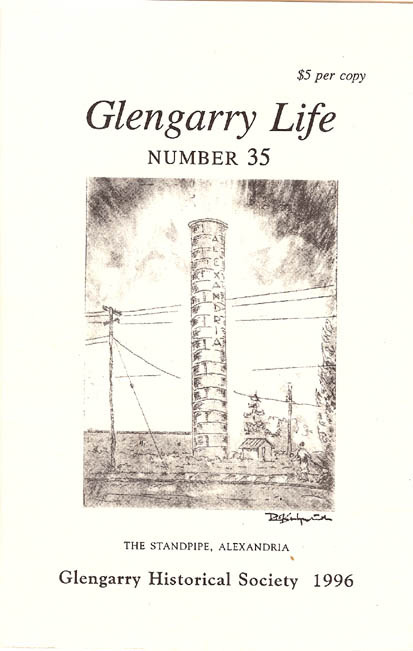 GHS 13th annual 1973 [13th a] light blue cover with sketch of Glengarry Pioneer Museum, 50 pages + cover. 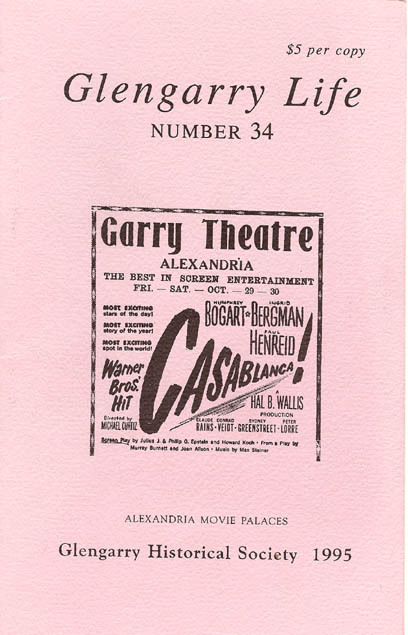 printed by Winchester Press Ltd.
GHS 14th Annual 1974-75, [14th a] light yellow cover with sketch of Nor'Wester Museum, 44 pages + cover. 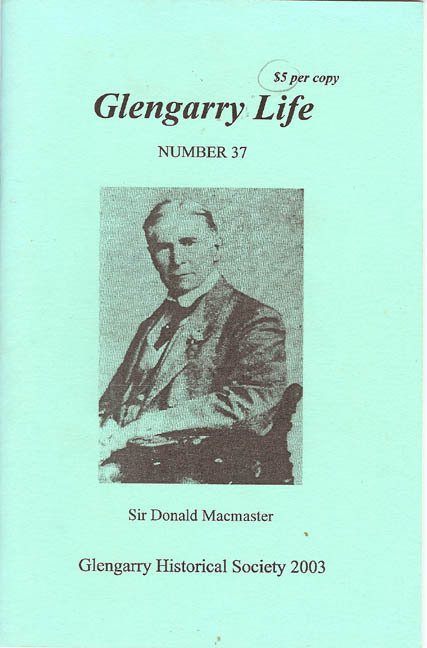 printed by Winchester Press Ltd.
GHS 15th Annual 1976 and Yearbook of 1975 activities, [15th a ora] orange cover with sketch of Glengarry & Nor'Wester Museum, 24 pages + cover. printed no indication where. 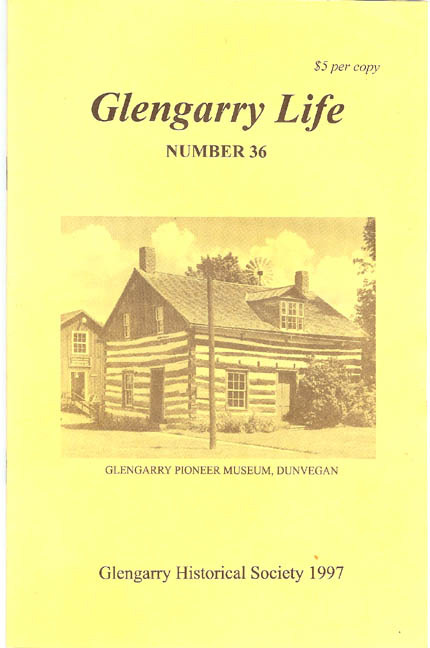 GL 1976 [GL 76 gre] green cover with sketch of Glengarry & Nor'Wester Museum, 24 pages + cover, printed Astro Printing  45 Pitt Street Cornwall, Ontario K6J 3P1. GL 1977 [GL 77] gold cover with sketch of Ruins of St. Raphaels by G.E. Broomhall, 24 pages + cover. printed no indication where. GL 1978 [GL 78] grey cover with sketch of Alexandria Grist Mill - 1885, 24 pages + cover. printed by the Print Shop Cornwall Ltd.
GL 1980 [GL 80] orange cover with photo of The Athol School, Kenyon Township, illustrated, 20 pages + cover. printed by the Print Shop Cornwall Ltd.
GL 1981 [GL 81] light beige cover with sketch of Inverarden Regency Cottage Museum 1816, 20 pages + cover. printed by the Print Shop Cornwall Ltd.
GL 1982 [GL 82] light green cover with sketch of Blacksmith Shop, Apple Hill, 21 pages + cover. printed by O'Neil Printing [Cornwall] Ltd.
GL 1983 [GL 83] Blue cover with the Gordon Presbyterian Church St. Elmo, 25 pages + cover. printed by O'Neil Printing [Cornwall] Ltd.
GL 1984 [GL 84] dark blue cover with sketch of Landing of the Loyalists, 25 pages + cover. printed by O'Neil Printing [Cornwall] Ltd.
GL 1985 [GL 85] bright yellow cover with photo of `Dunvegan Museum Window Reflection' 25 page + cover. printed by O'Neil Printing [Cornwall] Ltd.
GL 1986 [GL 86] beige cover, with photo of addressed letter to Donald A. Macdonald of date Sep. 17 1850, 29 pages + covers, printed by O'Neil Printing [Cornwall] Ltd.
GL 1987 [GL 87] orange cover with sketch of St. Andrew's Church Williamstown, 32 pages + cover, printed by O'Neil Printing [Cornwall] Ltd.
GL 1988 [GL 88] blue green cover with sketch of Bethune Thompson House, Williamstown, Ontario, some illustrations, 32 pages + cover. printed by O'Neil Printing [Cornwall] Ltd.
GL 1989 [GL 89] red cover with sketch of bagpipes and tartan shawl, 37 pages + cover. printed by O'Neil Printing [Cornwall] Ltd.
GL 1990 [GL 90] light blue cover with sketch of MacMillan Home, lot 9 7 conc. 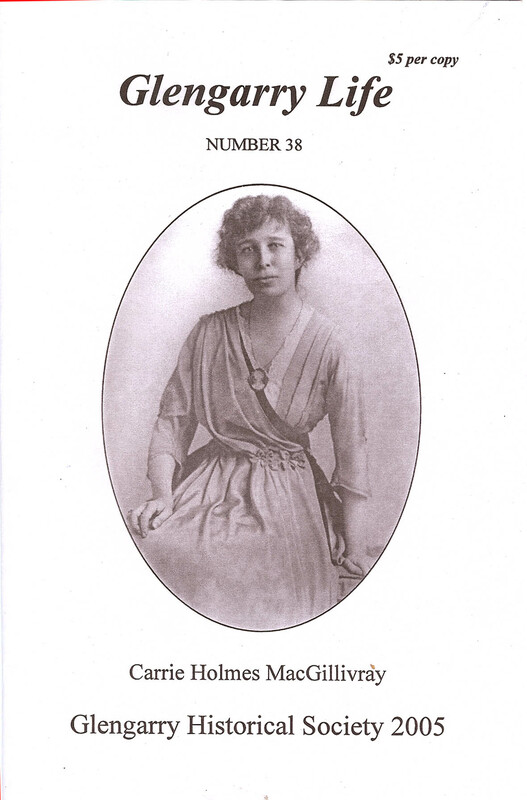 Kenyon, 29 pages + cover. printed by O'Neil Printing [Cornwall] Ltd.
GL 1993 #32 [GL 93] cream cover with post card photo of Burn Brae cheese factory, Martintown, illustrated, 34 pages + cover. printed by O'Neil Printing [Cornwall] Ltd.